Except for three sites in the Toúvla area there is little evidence of Hellenistic/Early Roman sites in the Almiros-Sourpi plain from the 2nd and 1st centuries BC. An abundance of artefacts was found on a recently ploughed plot of land in the Touvla area: pottery sherds, terra sigillata, loomweights, glass, hypocaust bricks and tiles. 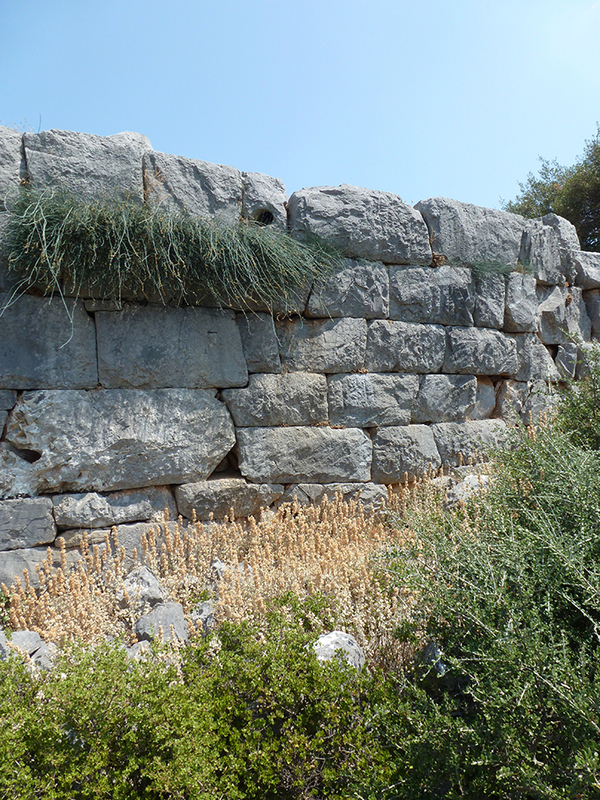 In two places, limestone blocks were piled up, obviously material from the walls of a building, possibly a villa. The toponym Toúvla (bricks) may have been derived from the hypocaust bricks of a Roman bath building. In the Óthris mountains, however, a number of fortified settlements are to be found as we have seen in the previous section. The largest site inhabited in the Hellenistic and Roman periods is the Kastro near the village of Vrínena situated in the foothills of the Óthris mountains. Stählin published a plan of a wall that blocked the paved route across a saddle to the fort. The wall stretch is limited in the west by an almost square tower and in the east by a tower or a protruding section of the wall. The interjacent wall has an indented trace, with the entrance gate to the fort situated halfway. An important observation at Vrínena was done during a survey in 1985. Instead of a small fort, as described by Stählin, the plan of a large, fortified site of about 3 ha could be mapped. Artefacts collected during the survey suggest habitation in Classical, Hellenistic and Roman times. The settlement of Vrínena is so far the largest site in the former territory of Halos that was inhabited in Classical, Hellenistic and Roman times; perhaps the key site where inhabitants of New Halos settled after the earthquake of 265 BC?